Young hero Bellamkonda Sai Srinivas is currently working on Sriwass’ action thriller, Saakshyam. The film is slated to hit the screens in May. For the first time in his 4-movie-old career, Sai will be teaming up with a debut director for his next project. Today, the makers of Sai’s next project have officially announced the details. The as-yet-untitled movie will be directed by Srinivas and produced by Naveen Sontineni under Vamsadhara Creations banner. 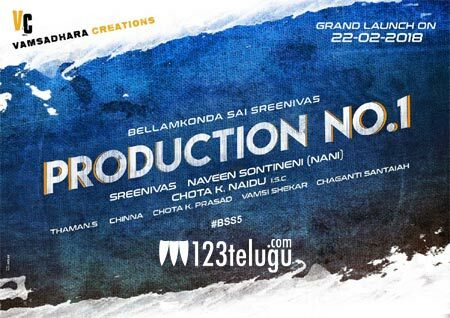 The project will be launched at a grand event at Ramanaidu Studios on February 22nd. Thaman will compose the music.